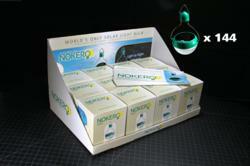 Micro businesses and entrepreneurs can now buy the Nokero BizBox and begin selling solar light to their communities. The Nokero BizBox is designed to help micro-business succeed. Nokero International, renown for bringing the world’s only solar light bulb to more than 100 countries worldwide, is now offering the “BizBox”, a set of 144 N200 solar light bulbs, 50 posters, 200 flyers, and two display cases that can help bring renewable energy to impoverished regions while simultaneously improving local economies. “In Colombia, where many families live on less than $300 a month, Nokero sales hold the promise of income for grassroots entrepreneurs, while at the same time serving the lighting needs of the community,” said Rich Mitchell, who has helped several vendors in Columbia sell Nokero solar light bulbs. One Columbian vendor, named Martin, saw strong interest in Nokero solar bulbs from people in his community. People with – and without – access to electricity wanted to buy the bulbs. Three months after seeing his first Nokero bulb, Martin is now selling the bulbs from his home’s garage, which he has converted into a store. Martin is one of many around the world who can buy the Nokero BizBox for $999 plus shipping on the Nokero website. That’s less than $7 per bulb, yet the retail value of the Nokero N200 on the market is about $20-$25. He also receives posters, flyers, and display cases written in Spanish, English, and French, that he can use to promote the product in his community. Not everyone who is best-suited to sell Nokero can afford to buy an entire BizBox – that’s where people like Mitchell can help. He can buy a BizBox and “micro-lend” the bulbs to several vendors. After they sell their bulbs, they have the money to buy more yet keep money for themselves, just like a traditional retailer. The result is that Martin, his family, and his community are benefiting from renewable energy, and making money in the process. They can use part of the money to buy more solar products and grow their business. This same scenario is happening in locations around the world, including Africa, Asia, and Central America. It's the first step in a long-term business plan to help develop a sustainable solar supply chain for Nokero's full product line. Nokero (short for No Kerosene) was formed in June 2010 by inventor Steve Katsaros to develop safe and environmentally-friendly solar products that eliminate the need for harmful and polluting fuels used for light and heat around the world and, most importantly, are affordable to the communities that need them. The light bulb is a shape known around the world. The Nokero solar lights unique bulb shape, its simple yet durable design, and its affordability mean the Nokero solar light bulb is humanity’s best chance at ending the practice of burning kerosene. Nokero also makes phone chargers and other solar products designed for low-income markets. For more information or high-res images visit http://www.nokero.com/media.